Two years ago, 21 Jump Street flew in under the radar, for reasons that hardly need explaining — it being based on a television series from the 1980s, expectations were understandably low. More than just banking on the nostalgia of an old TV show, the very act of adapting TV for film seemed like nostalgia for the '90s, the heyday of the sub-genre, when The Brady Bunch and The Addams Family first filled movie theatres. Surprisingly, 21 Jump Street was a success with critics and audiences alike, by all accounts funnier than it had any business being. 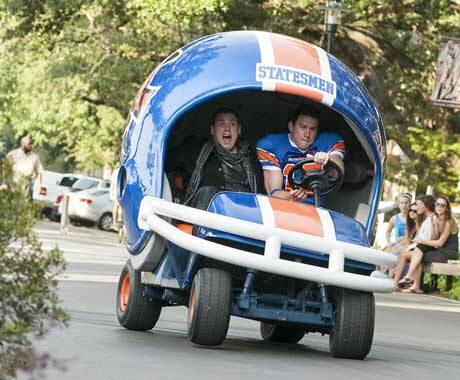 22 Jump Street benefits from similarly low expectations, thanks to the natural scepticism towards sequels and the filmmakers' ability to capture lightning twice. But in the time since the first film, directors Phil Lord and Christopher Miller have been busy writing another film sequel (Cloudy with a Chance of Meatballs 2) and writing/directing this year's similarly unanticipated The Lego Movie. In every case, they've more than just surprised audiences; they've completely won them over. Surprise is the key word, however. Lord and Miller are like the J.J. Abrams of comedy, making films that double as quasi-Christmas presents waiting to be discovered. Reviews are already calling 22 Jump Street a "sequel about sequels" and "the most self-aware sequel ever," but that's just pointless labeling. The film plays with the conventions of sequels and ends up with something fresher and funnier than Anchorman 2 ever bothered trying to be. It suffices to say that if you enjoyed 21 Jump Street — and who didn't? — you'll enjoy 22 Jump Street even more.